What a way to end the year! 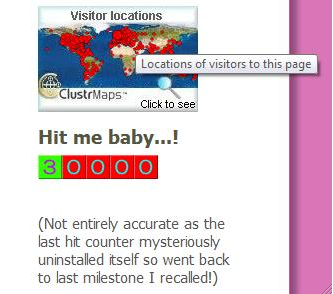 30,000 hits! When I checked my counter this morning, it read 29,927. 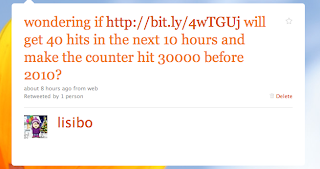 That set me wondering if I could possibly reach 30,000 by midnight to end the year off on a 'round number'! and then again (after prompting for a URL!) at 2 o'clock by which time I'd had another 30 hits! Thanks to Fiona for taking the screenshot at the top and for alerting the world to my mishaps! But joking aside, as the year draws to a close, I want to thank you for travelling with me through 2009 which has been quite a year - exciting, scary, inspiring, stressful, successful and unforgettable. PS to my reader in Kazakstan - are you Borat?? To my Icelandic reader - can I come and visit? And to my reader in he Aland Islands - welcome - I must find out where they are!! Sebastian 18#365, originally uploaded by Camino Z. Thanks Camino Z for this! Here's another gem - this time brought to my attention by Richard Mayor at Holy Cross Primary in Walmley. Thanks to @simonhowells for this suggestion. And thanks to @josepicardo as I understand Simon saw it on José's website! 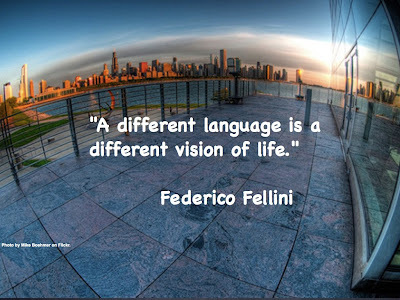 This is one of my favourite comments on language learning. 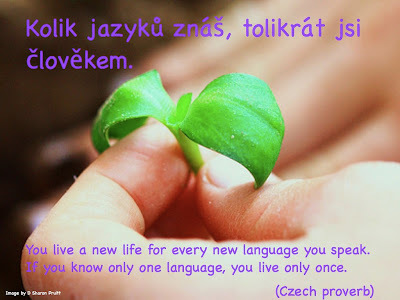 Posters to promote language learning. 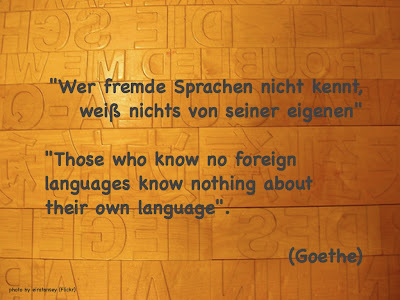 Over the next few days I'll be posting some 'posters' featuring quotations responding to the question Why learn languages? 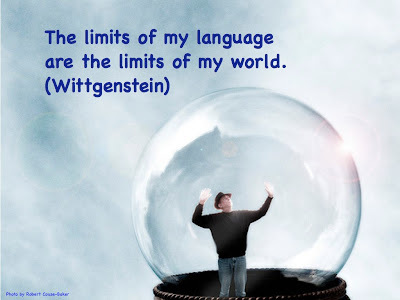 Here's the first, featuring a quotation from Wittgenstein. Had a little play around again with Wallwisher and made a wall of Christmas songs in Spanish and Catalan. Feel free to add your own! Comments, information, ideas etc also welcome! PS - I know the subtitle says 'Spanish speaking Christmas' and a few Catalan carols popped in - I do know!!! Navidad en la tierra y el mar. A lovely Christmas song, written by José Luis Perales and performed here by Los Toribianitos, and today brought to my attention by one of my online friends, Francisco Meza in Perú. The lyrics are below (courtesy of musica.com) if you'd like to sing along. mientras haya una estrella, habrá Navidad. Given my love of Pocoyo and the imminent festivities, I just had to share this clip with you. Here's a lovely Spanish carol I've found on Teachertube. it's originally from the LCF site Babelzone which is a (very reasonably priced I have to say) subscription site, but there are a number of their resources shared on Teachertube too. and for the French teachers amongst you, here's an alternative version of the Twelve Days of Christmas in French. Your chance to influence the BBC's PMFL content! 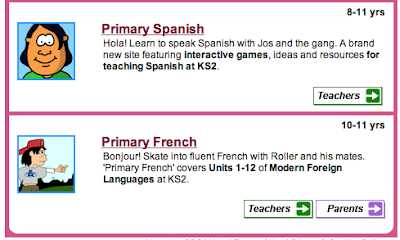 I'm helping the producers of the BBC schools website a bit this week, giving them some suggestions about their Primary French and Spanish pages. If you haven't seen them, there are animated characters to help you speak the language, games to practice the vocabulary in each section, and some interesting fact files about the countries, traditions, festivals etc. The sites are quite different in layout and content. for examples, the French site has two sections, 1 and 2 and is hosted by Roller. The Spanish site looks more minimal at first glance but has some interesting sections, not just on vocabulary. Do you like the site(s)? What is your favourite bit? Wat doesn't work for you? What would you like added? 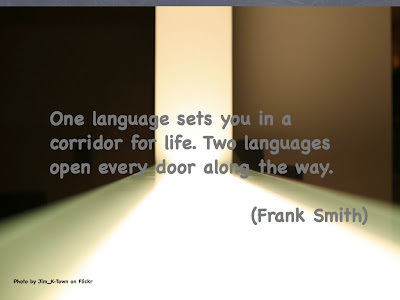 which resources are most appealing to you - games, activities, worksheets, quizzes, songs, factfiles, sound files, flashcards, grammar notes, video clips, world language clips?? Leave a comment below or tweet me @lisibo or contact me directly via my email. 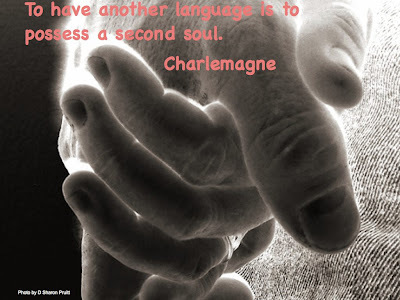 Don;t miss your chance - if you dont ask, you don't get! I thought I'd remind you of a couple of posts from last Christmas that are still relevant now - Firstly, some ideas of resources for Christmas. Check out Talkabout Primary MFL for ideas on sending messages via penguins and singing mulitlingual Christmas carols. Mark Purves has put together a quiz using Smartboard for French cultural information. The BBC Primary Spanish site has a slideshow about events over the Christmas period in Spain. A few ideas in this thread on the TES Forum and you can always check out resources in the TES Connect Resources area. That should keep you going! And a video to finish! 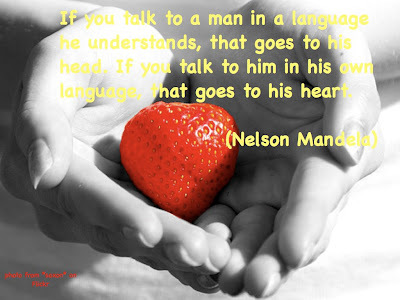 Earlier today on Yahoo MFL Resources, Jane shared a Powerpoint presentation under the subject - Helping pupils be nice? So I decided to do just that! I've made a couple of alterations and made it into an Animoto video by saving the slides as .jpg files, uploading them to Animoto as images, choosing some suitable music and leaving the rest to Animoto. Sadly not as a Blue Peter presenter, but I have recently been involved in some work for the BBC World Class site. BBC World Class is an initiative bringing the benefits of international school linking to schools across the UK. World Class also encourages children and schools to get their stories on air and on line across the BBC. 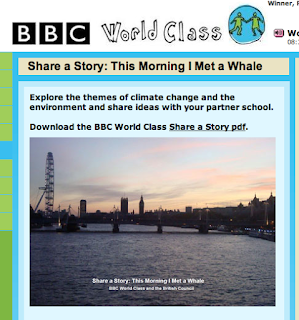 Thanks to a recommendation from Liz Hitchcock of the British Council, I was asked to work with BBC World Class to come up with some resources to link a reading by Michael Morpurgo of his book, This morning I met a whale, to the Copenhagen Climate Change Summit via a 'Share a story' activity. The idea was that two (or more) partner schools read the book and complete some activities that they can share with one another. You can download a PDF of the activities and enjoy the beautiful pictures of the Thames and the whale. I thoroughly enjoyed Michael Morpurgo's beautifully written story, based on real events in January 2006 when a 15 ft northern bottle nosed whale was found swimming past the Houses of Parliament before getting stranded at Battersea Bridge and sadly dying before it could be returned to open water. In the story, the whale comes with a message for the children (because adults are hard hearted) to pass on the message that we need to look after the planet. A simple story with a powerful message. Even if you haven't got a partner school or even a class with whom to do the activities, I'd recommend the book as a good (very quick) read - for children and adults alike. 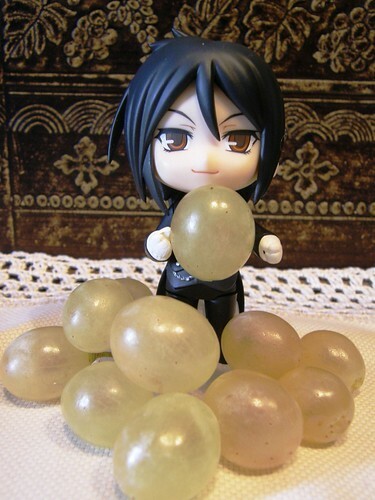 And if you use the activities, well, let me know what you think. They're not all my work - I just gave ideas, some of which haven't been used - but I'm obviously interested in views as they have my name on them!! 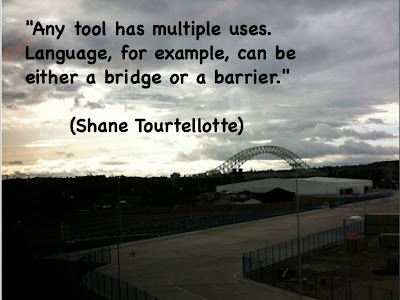 If you missed last night's Teachmeet EdTechRoundup, never fear! You can catch up by watching the archived stream. And Flickr photos of participants are here. This evening I will presenting at Teachmeet EdTechRoundup on the above subject, sharing how I use sound recording in my classroom and suggesting why it is such a valuable tool. Here are some references / notes that go with what I will (might?) say! s talking postcards and talking photoalbums. My own Podomatic podcast - Lisibo talks! And we're on iTunes too! Voki - we love Voki at WCPS! 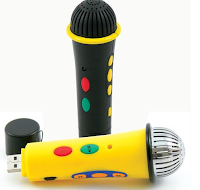 Voicethread - another great tool for using sound recording in learning. Here's one I made to give people an idea of how they work! Our school wikispace- WCPS.wikispaces.com - giving examples of use in other areas of the curriculum eg RE, Literacy. You can watch it live here and learn from a vast array of people who will be sharing what goes on in the classroom. I'm currently watching a live Twittercam stream from Saltash School. They have visitors from Cool Earth with them today, and are broadcasting live an interview with Javier from Peru who will be talking about living in the Amazon and the effect of climate change on his life and surroundings. Read more about it here.